Too bad the script reveals gaping holes as it unfolds, never adequately satisfying us. I wasn’t convinced either that Dolly or her gang performs these cons for financial gain. And yet, despite these shortcomings, I will admit, I enjoyed the film. Dogra gives us endearing characters. Never overstaying its welcome, the film is short and a lot of fun. I’m going with three out of five for Dolly Ki Doli. It’s worth watching for Rajkummar Rao’s excellent performance alone. On the whole, Dolly Ki Doli is an enjoyable entertainer which will keep the audience smiling/laughing but business-wise, it will prove to be an average fare because of its extremely poor start. Of course, collections will pick up due to mouth publicity, and the additional national holiday on Republic Day (26th January) will prove to be beneficial for the film, but since there are other films slated for release next week, it has only its first week to do the maximum business; and the dull initial will tell on the first week’s business. With its winsome ensemble of actors, background actors and walk-in parts, the lighthearted caper radiates an attractive energy that’s pleasant to be around even if hardly profound. Moreover, Dolly Ki Doli goofs on the coy dulhan stereotype with such wicked relish it never gets dull. There is much to like in Dolly Ki Doli. Or, let us put it this way: there isn’t much to dislike in Dolly Ki Doli. Dolly is a rebel all right, but the precise motivations for her battle against the established social order never emerge with clarity. As a result, the character remains a blurry blob as she takes one man after another for a ride. But for all its obvious flaws and failings, Dolly Ki Doli is not completely unworthy of the 100 minutes that it demands from the audience..
Debutant director Abhishek Dogra’s con-bride story is simple and refreshing. It’s filled with some laughable moments, hilarious performances and quirky characters. There aren’t too many highs or dramatic turns; Dolly’s past story is unconvincing and her track with Pulkit is the weak link in the plot. The climax is a sweet surprise, so hold on for it. After wedlocks across the country, there’s only one faint picture of Dolly’s shaadi? Really? What’s ‘app’, guys? 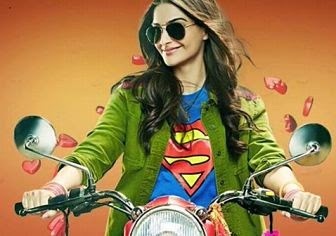 ‘Dolly Ki Doli’ has a great idea, and starts off well, but then falls into a familiar trap– of a single-track leading lady piloting a half-baked plot. But the plotting and the treatment of the character shows up Kapoor’s limitations : she is good-natured, but not versatile. Ultimately, ‘Dolly Ki Doli’ is neither biting social comment, nor unfettered fun. But the problem with Dolly Ki Doli is that it does not give a plausible ending to the story. Dogra, who co-wrote Dolly Ki Doli with Uma Shankar Singh, did have an interesting plot — the journey of a girl who takes on the bad world of men and the hypocrite institution of marriage. But why does she do it? That is exactly where Dogra’s script fails. So should you watch Dolly Ki Doli? Go for it, for the entertaining performances. Despite the shoddy script and loose strings, this is worth a watch. On the whole, DOLLY KI DOLI is a stress buster that will make you smile as you’ll leave the theatre. Debutante director Abhishek Dogra has competently extracted superb performances from the entire starcast. The unpredictable climax of the film works to the advantage too. But the four day weekend will help this Dolly ensnare many patrons. The word of mouth will be the key in witnessing the growth. We say, it’s a roller coaster entertainer. Enjoy it with your families. Dolly Ki Doli is a simple-n-sweet entertainer that promises fun and laughter in those 1.40 hours. Tight screenplay. Competent direction. Dolly Ki Doli also works because of wonderful performances by Sonam Kapoor, Rajkummar Rao, Pulkit Samrat and Varun Sharma. Dolly Ki Doli is a time-pass entertainer that you can enjoy if you keep your brains at home. This film comes as a breath of fresh air from all the South remakes and thought-provoking dramas that are most oftenly served. After particularly loving Varun Sharma’s comic antics and Rajkummar Rao’s sheer genuine acting, I am going with a 2.5/5 for this peppy film.